The Puppies and Kisses baby quilt is 43"". The incredible soft quilt is made from Shannon Fabrics Cuddle Soft Minkee and is so soft you have to feel it to believe it. 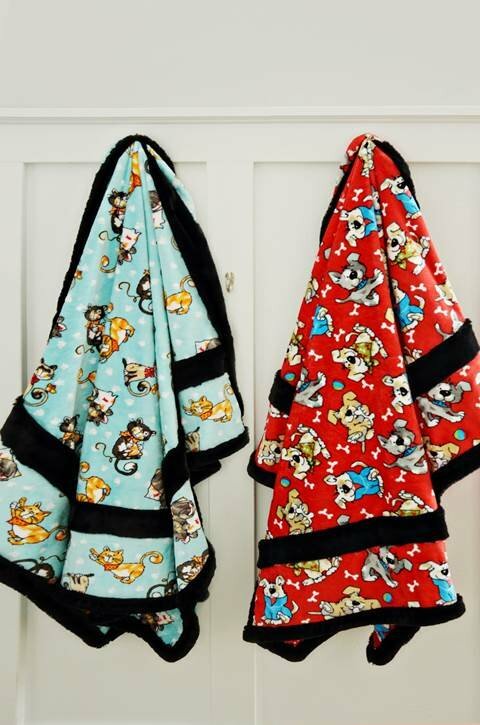 Everyone loves to snuggle in these soft quilts. The quilt is based on the basic "Sew and Flip" method where you sew through the back and batting as you attach each strip. When you are finished attaching the strips the quilt is ready to bind. You don't have to have it machine quilted. When you use our suggested fusible fabric spray to secure each strip down after it is sew, your quilt is flat and square. In this pattern, you will glue the center down, and then add the outside border strips. Go to our learning center to find more ideas on how to make this quilt. Using a light weight batting is optional, depending on how warm you want it to be.